"PALM SUITE" is a unique holiday apartment that hosts up to 6 guests in 2 bedrooms with en-suite bathrooms, an open kitchen and large living room open it self on the terrace offering a wonderful space to enjoy your holidays. 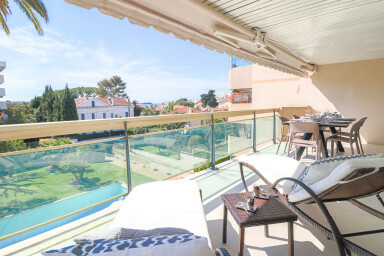 Perfectly located in Palm Beach a quiet and accessible area of Cannes, you will be only 100 m away from the beach and 10 minutes away from the city center. This 100 sqm apartment was beautifully renovated and designed in 2019. Guests will enjoy a 20 sqm sun-soaked terrace, a shared pool and a large sun deck for tanning. 2 bedrooms, 2 beautiful bathrooms, a modern and renovated kitchen with brand new appliances and Air-conditioning in each room.